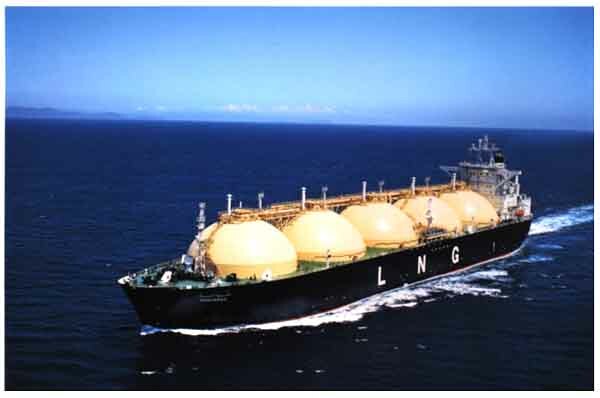 Kawasaki Heavy Industries, Ltd., Sakaide Works, delivered the 135,000m3 LNG Carrier SHAHAMAH in October 1994 to Shahamah Inc. of the United Arab Emirates. This vessel is the second of four (4) identical LNG carriers planned for transpotation of LNG produced in Abu-Dhabi to Japan. 1. Cargo tank system is of five (5) Moss type independent spherical tanks made of aluminum alloy. 2. Kawasaki Panel System for thermal insulation of cargo tanks is adopted. 3. Designed specially for long-distance transport, the vessel has a higher length-beam ratio and energy-saving hull form. 4. To widen fuel optious, a dedicated vaporizer is provided to intentionally generate boil-off gas as required for propulsion.